My dear friend, and former boss, Jack Sommer, was able to obtain a steel beam from the World Trade Center. It took him a year to accomplish this. 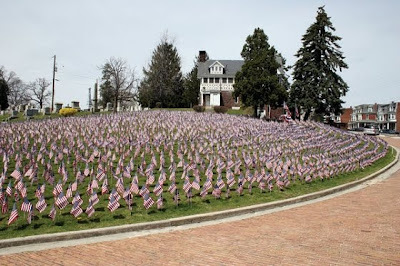 He already has an Iraq War Memorial at his cemetery which showcases over 5,000 American flags and banners. He is building a new memorial to honor our fallen heroes from all the wars – the steel from the WTC will be part of this memorial. 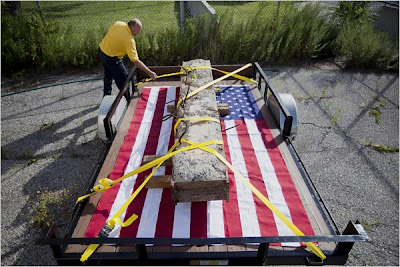 On Friday, Jack Sommer, the president of Prospect Hill Cemetery in York, Pa., came to Hangar 17 to collect a piece, watching as a cemetery employee strapped a chunk of steel, concrete and gnarled rebar to a trailer. In an added flourish, the men had spread an American flag under the steel. A Port Authority police car escorted them out. If you should be in York Pa on Friday, 9/11/09, here is the agenda . . .
At 10 o'clock there will be an acceptance ceremony at Prospect Hill Cemetery.